What sets Medics for Life apart is our experience with real patients and real workplaces, just like yours. With over 30 years training experience across industry, primary health care (including Medicare Locals/Primary Health Networks and general practices, medical centres and industries throughout NSW), schools and the general public. 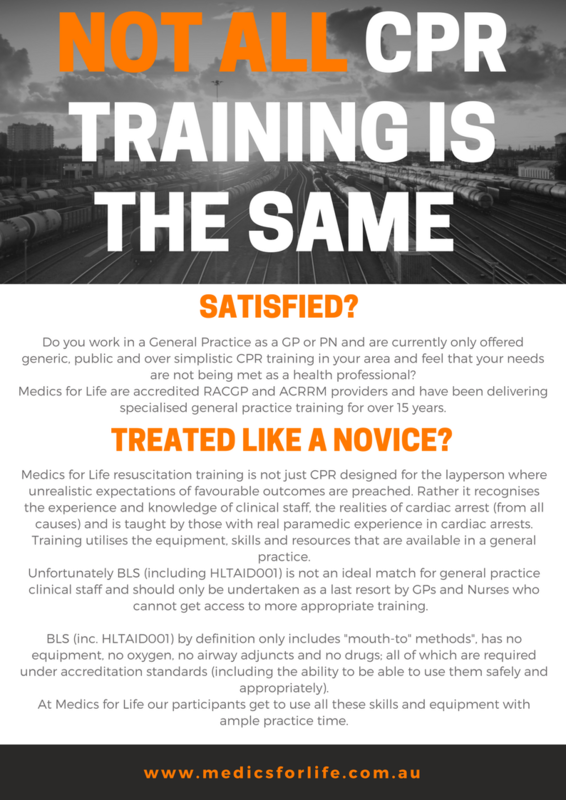 Together with over two decades working in pre-hospital emergency care (Advanced Paramedic) and senior management in primary health care organisations, we are the perfect choice for your RACGP, ACRRM and VET accredited staff training. Why choose Medics for Life over other providers? When people usually think of CPR or First Aid training they often think of the big providers, but the fact is big doesn't necessarily mean better or more qualified. Under the ASQA structure, any accredited course delivered by (or on behalf of) a Registered Training Organisation (RTO) carries the same qualification and standing nationally. They tend to charge a premium for their name rather than the quality or standing of the qualification. They carry large overheads that they pass on to the customer. They are not specialists in providing training to primary care (particularly clinical staff).. Most of their trainers lack any experience of the things they are teaching others and usually have no qualifications in the subject beyond their students. Course material is highly structured and generic. This means that regardless of the customer or workplace needs, this structure cannot be altered e.g. prior knowledge and experience/training, special hazards in a workplace or clinical qualifications. They tend to market their courses as representing a more recognised qualification. While this may have been true many years ago, the fact is that today this is just marketing. All accredited training carries the same qualification, recognised anywhere in Australia (this is why we have a national training system). These larger providers are often not accredited RACGP or ACRRM education providers, leaving GPs to chase their own points. Heritage College Lake Macquarie recieves their AED and free training from Medics for Life.